First of all, thanks to Jim for joining us here, and helping to make the mundane magical! I’ve known Jim for a loooooong time – we met my freshman year in college, <cough> years ago, through a mutual friend. I served as an early sounding board for some of Jim’s early Star Trek fanfic (you knew I’d mention that, didn’t you? :)) and later, as a beta reader for his first efforts at publishing crime fiction. Jim returned the favor and gave me some good advice for Time’s Enemy, and assured me that, yes, Tony indeed thought and acted like a guy. Well, when I signed, the publisher was full of energy, and everyone on the roster became everyone else’s cheerleader. There were some hiccups getting Northcoast out, but it was a fun ride. And at the time, I had some money to spend on travel, so I used that to beef up my networking and get to know authors and booksellers. That first year was fun. The second year was not so fun, but when any business goes under, there’s no clean way to sever ties. It’s too bad, because I really thought they could do something or be a decent launchpad for a lot of the writers. I think that’s true of a lot of small presses when they overreach. I remember UglyTown did not go quietly, despite both the publishers’ and authors’ best efforts, and Point Blank just sort of faded away. But for a short time in the middle of the last decade, it was a wild ride. There are two more books featuring Nick Kepler, the protagonist of NCS, both of which I also beta-read and really enjoyed. I remember reading Bad Religion at work during a slow period, and having to restrain myself from laughing out loud. IMO, these books deserve to see publication, and NCS deserves another chance. Now that you’ve gone indie, do you have any plans to (re)release them? Northcoast will definitely be out later this year. Noir master Ken Bruen wrote me a very nice intro, and I found out it was sitting on a shelf he uses for quotes when he writes. So I was very touched by Ken’s intro. He’s been one of my mentors for years, and I have one project under wraps that will bear his name on the dedication page. I’m not saying which one. The second book, aptly titled Second Hand Goods, is going to get a rewrite and a fresh edit. I’ve evolved as a writer, and since its collected cyberdust for the last five years, I can look at it a bit more objectively. Bad Religion is just screaming for some fresh material based on my experiences since the early drafts. I’ll likely downplay Nick and Elaine somewhat to focus on some of the other characters. Which brings me to your new release, Road Rules. This book has a history of its own, including snagging an agent’s interest. Can you share a bit of that with us? The seeds of Road Rules have been around for some time. Tim Mason was the earliest. A mutual acquaintance of yours and mine introduced me to this weird coworker. I’d toyed with making him a lawyer in a standalone (picturing Seth Green in the part) and a thorn in Kepler’s side, a role eventually taken by the Eric Teasdale character. A couple years later, my publisher and I kicked around the road trip idea. I wrote a short sketch about two guys in a stolen Cadillac trying to get to Miami. Tim Mason sort of attached himself to the story. After I got orphaned, a few friends prodded me into doing NaNoWriMo in 2006. So I fleshed out the story, hit on the idea of the decadent, yet spiritual drug lord, Julian Franco as the cause of all this chaos, and boom! The story demanded to be written. Road trip stories are always fun! I love your tagline, “The road to hell begins with a stolen car.” But what really pulled me in were the characters. Were there any particular events, places, things you saw/heard/read that inspired the overall premise of the book, its events, or any of the characters? The route they took was once the “long way home” from Hilton Head, SC, over a few years last decade. And having visited Savannah a few times in the process left me longing to write something set in that city. I still wanted to write about Cleveland, where I-77 begins, so the setting fell together easily. I saw a few shows on History about holy relics and one of those true crime things about the theft of one such relic. Put those together in a city with a large Slavic population and you get St. Jakob. Mike is based on years of working in the insurance industry. Maybe too many years. And Cinnamon was part of my desire not to have a bunch of macho white guys hosing the freeway down with testosterone. Plus, instead of the angsty tarnished knight, she’s someone just trying to prove herself. 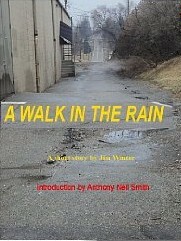 Back in May, you released your first indie title, a short story called “A Walk in the Rain” (also a good read). What made you decide to go indie? Well, crime doesn’t really pay well. Of course, I’ve got a short story in West Coast Crime Wave coming out this month from Bstsllr.com, which I did get paid for, but the paying markets are few and far between. I decided to get paid for my short work. I also found out that 1.) It’s the cover, stupid (though content still rules), 2.) people don’t really buy a lot of short fiction on Amazon unless it’s a collection, and 3.) it might help if you actually market an ebook. Now that you’ve tasted the control and flexibility that comes with indie publishing, are you still pursuing a traditional publishing contract, or perhaps another agent? I think eventually, I’d like to go traditional, but only under certain circumstances. I’m in a position now where I don’t have to make this a career. So the terms have to be right, and I have to be able to keep control of material I’ve already published. But if the right deal can be worked out, sure, I’ll sign. Are you planning to offer Road Rules in print? If enough copies sell, I’ll put it on CreateSpace. If a publisher makes a sweet enough offer, I’ll seriously consider it. Now that Road Rules is out, what’s next for Jim Winter? Northcoast, as I said, will be coming out. And the other two Keplers will see revisions and fresh edits. Then there’s my “magnum opus,” which I’ve been reworking since the original draft checked in at 105,000 words. Thanks again for being here, Jim! And to everyone else, Road Rules is a fantastic, fun read that you owe it to yourself to check out, even if you don’t normally read crime fiction. It’s a fast-paced caper that will keep you reading – and laughing – all the way from Ohio to Georgia, along with Mike, Stan, and Cinnamon. Road Rules is available in your choice of e-formats for a knockout price of $ .99 at Amazon, Barnes & Noble, and Smashwords. 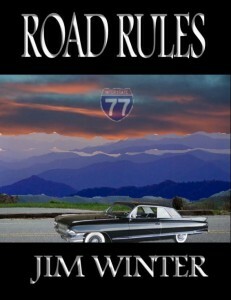 Jim keeps a fun, entertaining blog at http://eviljwinter.wordpress.com where he writes about books, publishing, sports, Cincinnati, technology, and whatever else strikes his fancy. Anyone have questions for Jim? Feel free to ask, or just comment to say Hi!